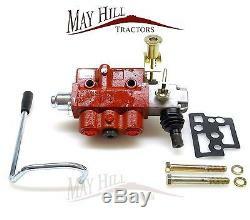 Hydraulic Single Spool Selector Valve Block Kit includes all shown in pictures. 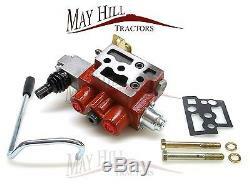 Single spool hydraulic valve kit for Massey Ferguson tractors. Kit includes 1 valve with adjustable detent. Knob to turn hydraulic valve on or off along with handle that is formed with a crook to bypass interference with the seat. Valve mounts on the lift top with supplied bolts, gasket and lock washers. Fits MF tractor models: 135, 150, 165, 175, 178, 230, 231, 235, 240, 245, 250, 253, 255, 261, 265, 270, 275, 282, 283, 285. 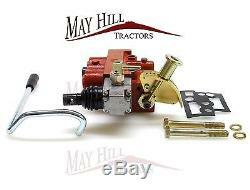 MAYHILL TRACTORS PART NO: 9453. (Please quote when contacting us). All Major Credit/Debit Cards Accepted. The 24 Hour Next Day Service only applies to England & Wales the following postcodes are 48 Hour and a surcharge is applied. Scottish Highlands AB30-38, AB44-56, FK17-99, G83, IV1-28, IV30-39, IV52-54, IV63, KW1-14, PA21-33, PA34-40, PH18-26, PH30-41, PH49-50. Scottish Islands HS1-9, IV40-51, IV55-56, KA27-28, KW15-17, PA20, PA41-49, PA60-78, PH24-44, ZE1-3. Northern Ireland - All Postcodes. 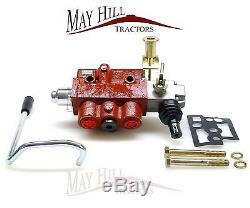 The item "Massey Ferguson 135 165 Tractor Hydraulic Single Spool Selector Valve Kit #9453" is in sale since Sunday, July 10, 2016. This item is in the category "Vehicle Parts & Accessories\Commercial Vehicle Parts\Agricultural Vehicles\Agricultural Vehicle Parts". 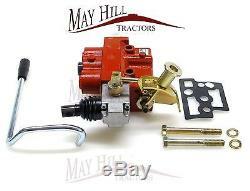 The seller is "mayhilltractorparts" and is located in Longhope. This item can be shipped to United Kingdom.